Donald J. Horowitz: When you first came, were you given any special orientation or training or anything of that sort? No, because as a counsel for the (_______) department, I used to do the appeals. So we do appeals from the trial briefs. So I, we, we knew what to look for and what to present to the appeals court. Apart from that I didn’t have any experience in, as a trial judge. But of course I will say something; I have also functioned as judge advocate. Yeah, sometimes because they, there of course you have to address the, the panel and guide them to come to a conclusion. That, how, how that happened was they used to, the army, navy and air force, whenever they have cases they used to get a member from our department as a judge advocate. So I have functioned as judge advocate in about two, three cases, that is the only way I have attended in trial matters. DJH: Okay. 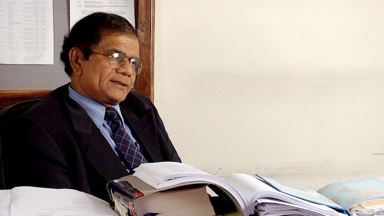 Is the Sri Lankan court system a common law system or a civil law system? Common law system. Same as Tanzania, India, Malaysia . . .
DJH: And I assume America? DJH: And when you came here you found that there was a different sort of procedure. Ye-, yeah this is hybrid system. DJH: Can you tell us what that means? That means you get, both systems are amalgamated here in this, so you get the civil law system as well as common law system. Some features are put together and that is how they have created the procedure, procedure here. So sometimes it’s a little bit confusing for us. DJH: Mm-hmm. And perhaps it would be confusing for a civil law judge too because of the common law. Same, same problems I think they, they too have. DJH: And that’s one of the reasons I asked about the training or, or orientation but there was no-, apparently . . .
Yeah . . . there was nothing, beca-, I came as a replacement so simply walked in . . .
DJH: Yeah . . . (____), but you’ve seen other judges come too in the ordinary fashion. Have they had any . . . ? Yeah . . . I'm not sure; (__), I, I, I have not heard anything about them getting any kind of orientation or training. DJH: Okay. Was there any help that other judges would, you know, give, informally? Well, I came here on the 7th of September. I started the case on the 10th. Others also didn’t have much time to guide me. DJH: Okay. How, how many, how many cases, can you tell us, have you sat on to conclu-, to conclusion? I am still doing the very first case I have started. In between, I have done Muvunyi, Rukundo, and there was another case where that person tendered a plea. Rugambarara . . .
And two other cases where I did the initial appearance, I can't remember the-, remember these names. DJH: So the two cases, other than the one that's been going on for some time, the two cases that you heard through to conclusion . . .
DJH: . . . were they one-, one-defendant cases or were they multiple? DJH: They were one-defendant cases. (___________). DJH: And, and will you . . . ? This one is four accused, and those cases it’s very difficult to conclude because there are four people, four accused, four counsel, cross examination done by all counsel, so that takes a (___), big amount of time. DJH: What is the name of the case which is the, the one that's going on? This is known as – this is known as Military 2. DJH: Military 2. Yes, okay. DJH: And who are the other judges on the panel? I have one judge from Korea, Judge Park, and another lady judge from Jordan, Judge Taghrid Hikmet. DJH: Okay and have you all been on the case throughout? They too came on the same day with me in this tribunal. DJH: Okay, so you got, formed a little community. Yeah, so if I had someone who had little bit of experience here it would have been okay, but all three had to start on the same day. DJH: Okay and are, is the case getting – without getting into the, what, what all in the ca-, is the case getting somewhat close to conclusion? Now we are at the tail end, but even today I had only one witness. We started at 9 and got down at [10:30] this is how the progress is. We can't say anything because the, always the defense says, “Well, we want to have a full defense so you must give us time.” And we started this session on the 8th of September, and I think we may not have concluded even ten witnesses, for this session, because of lack of witnesses, due to lack of witnesses. DJH: You’re in the defense side of the case. We are on, on the defense that is why we have to be careful otherwise whenever we say, “No, you must finish it,” they say, “No, we have to – you have to give us time. We have to find our witnesses, they are very difficult.” It is also true that it is difficult for the defense to get witnesses. So otherwise their complaint is that, “Well, we are not getting a fair hearing,” so in order to overcome that we have to sort of bend backwards. DJH: Okay. When did the case first start? It – I said 10th September. DJH: You said this session. No, th-, this, this case started on the 10th September of 2004. DJH: Oh 2004 . . .
DJH: . . . you didn’t say the year. Okay, okay, okay, that’s right, right, shortly after you came. Okay. Yeah, just three days after I came. DJH: Okay, so it’s a little over four years now. Yeah now it’s over four years. DJH: (__), and, and you are hopefully . . . Prosecutor finished his case in two years. After leading 72 witnesses, he has listed 115, but ended up with 72. And thereafter the defense wanted time to prepare for the defense and to look for witnesses. And when I gave the first accused, he said he need six months to look for his witnesses and bring them. With the greatest difficulty, we managed to start in about three months’ time. I said, “Whilst we prolong, you better get organized and come with your witnesses.” And somehow or other he took about a year to conclude his 42 witnesses. DJH: Is this any (___) . . . So with that I think I, we managed to finish the first one. Second wi-, accused was a little faster. He also called about seven-, 40 odd witnesses, but he was a little faster than the first one. Then the third one we started, concluded this session and along with that, sooner to that he finished, got down to the fourth one. And I had given them ti-, time to the 5th of December. And I can see from the way that he’s going, he must be having something in mind to ask for further two weeks in January, which I am determined not to give. DJH: ‘kay. All right. Can you just again, without going into – the nature of the defendants. You said Military 2. Yeah this is – first accused is the Chief of Staff of the Rwandan army. Second accused is the, wa-, was the Chief of Staff of the Gendarmerie of the Police. Third one is a Major in the army, 4th one is a Captain. DJH: ‘kay. And I assume they're charged with genocide and (___) . . . Yes, usual charges . . .
. . . genocide and yes . . .
. . . extermination and so on. DJH: Right. Et cetera. Okay.